T-24E Electric Tapping machine only weighs 110lbs. machine only and plugs into a standard outlet, and has a built-in drive unit that taps 3 - 8inch pipe, steel plates, and concrete walls quickly and safely.. Operating Max. Pressure: 300 PSI. @ 100 F. Operating Temperature: 250 F. @ 250 PSI. 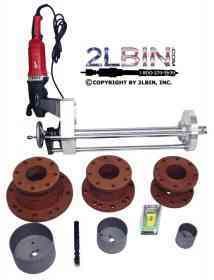 1 T-24E Electric Tapping machine w/ drive motor & GFI protection. Includes operating handle, adaptor bolts, T2 stand, pilot pin screws and operating manual.